Size: 5-9, Color: White w/Grey Vent (-) is currently out of stock! 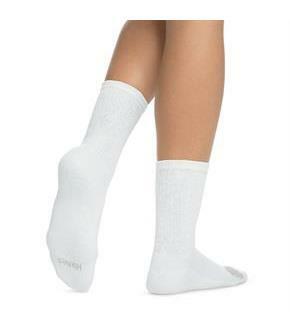 No matter what your day brings, your feet will take comfort in these breathable Cool Comfort crew socks. Wicking breathable Cool Comfort fabric keeps your feet cool and dry.Crew length socks stay up and hit at mid-calf.Cushioned foot bottom provides comfort without added bulk.Breathable mesh panels for ventilation.Made with a touch of spandex for superior comfort and fit.Comfort toe seaming, our most comfortable seam ever, provides a smooth, virtually seamless fit.Available in a convenient 6-pack.